I’ve always liked Star Trek, well, the original series anyway. The sequels and movies leave me cold I’m afraid. I quite enjoyed the cartoon episodes that I saw and I’m looking forward to buying the dvd set when it’s released. More recently, Star Trek New Voyages is keeping the original series alive with new episodes on the internet which I think are excellent, especially considering they’re put together by fans working for free. 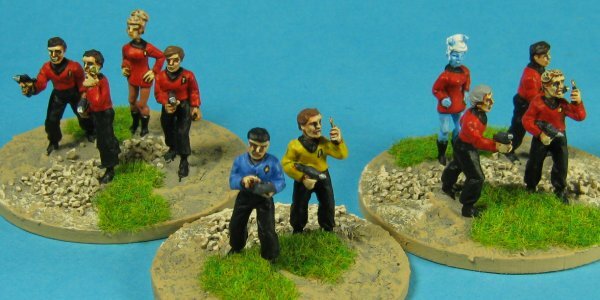 I’ve always wanted to do a Star Trek miniatures game but there have not been any figures released in the original uniforms that are worth getting or easily available. Eureka used to do some but they weren’t licensed so they were pulled and First Corps have these in their gallery but they’re not very good in my opinion. The answer was to make my own. I had a go and I am not good at sculpting things so I soon gave up. Help was at hand though in the form of Brian Cooke who sculpted me the figures I needed for a very reasonable fee. I needed to keep the costs low; I can’t sell these to recoup the cost of the masters and moulds, so a series of dedicated poses was out of the question. I decided to go for two male bodies and one female. I settled on a standing pose for the female and one of the male bodies and then a walking pose for the second male to add some variety. I didn’t want anything too ‘action packed’ as Federation crewmen seldom seem to do anything more energetic than a quick jog. To accompany my bodies I asked Brian to make a series of heads, male and female, Human, Vulcan and Andorian. The budgetary constraints of the original series were coming to my rescue here as the human bodies will do for all three races. 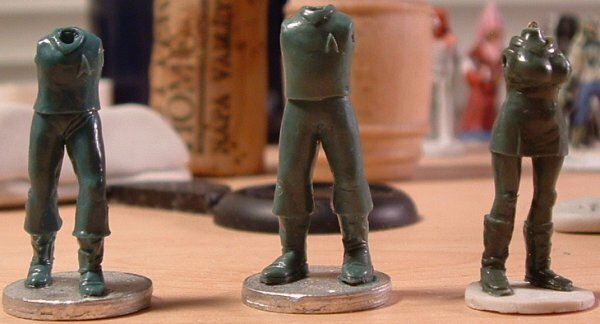 I can always take heads from existing 28mm figures and do some conversions for even more variety. I had al the arms made separately too. They can be positioned in a lot of different ways. 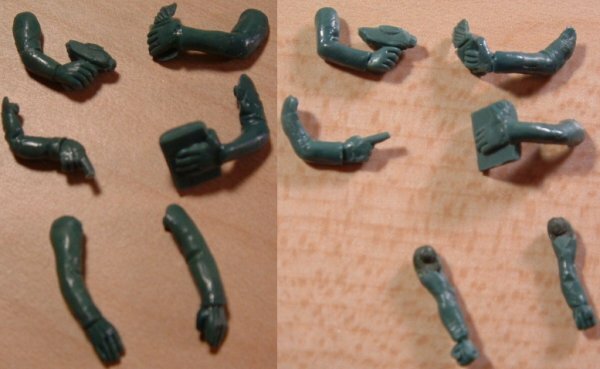 There are male and female arms with hands operating phasers, communicators and tricorders as well as just empty hand versions. 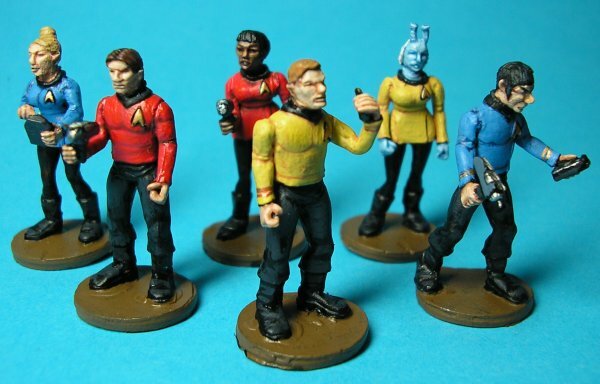 Finally there are separate phasers, tricorders, communicators and a phaser rifle to add to the figures’ belts etc. So, now I’ve got my greens and I’m on the verge of getting some masters cast up. It wasn’t cheap getting this far but this is probably the one single setting I’ve always wanted to wargame and I consider the cost worth it. Ben at Black Cat Bases made a mold for me and I finally had some castings. Alas, these were still too small for me to see and work on comfortably. I spent many hours trying to assemble them and finally gave up in frustration. My first castings arrived from Mike Broadbent a little while ago. Single piece figures are so much easier to deal with and it only took me three days to paint up a decent sized landing party. 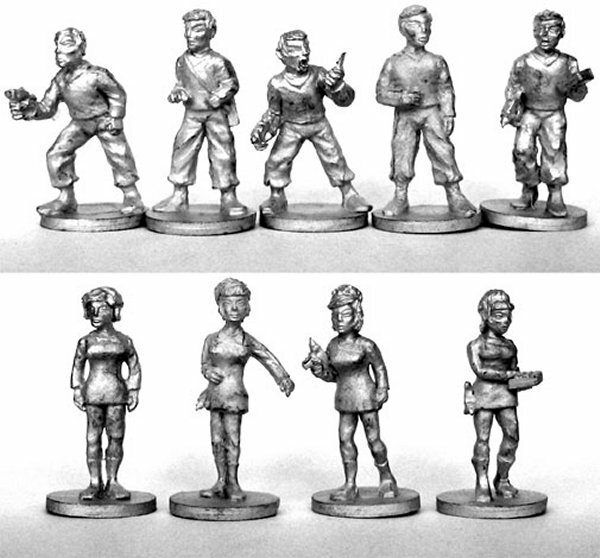 There are only five different figures, four males and a female, but with the different uniform colour options and a very quick addition of some antennae to make a pair of Andorians I have enough variety for wargaming purposes. 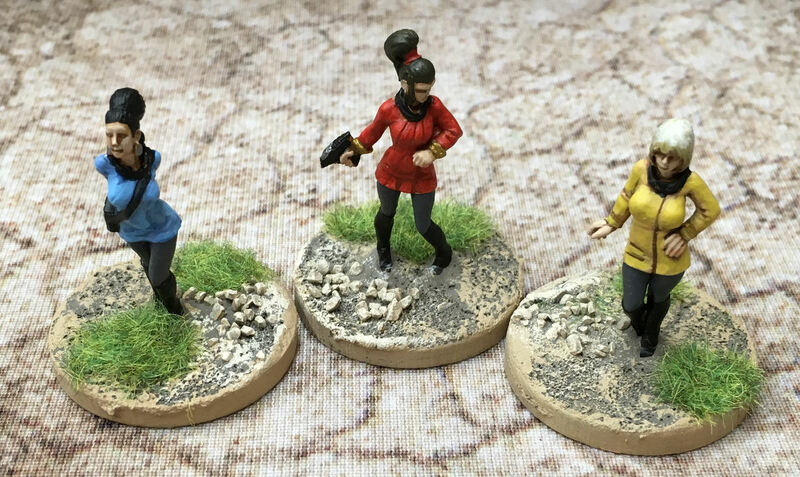 Here are the three mixed crew landing parties. 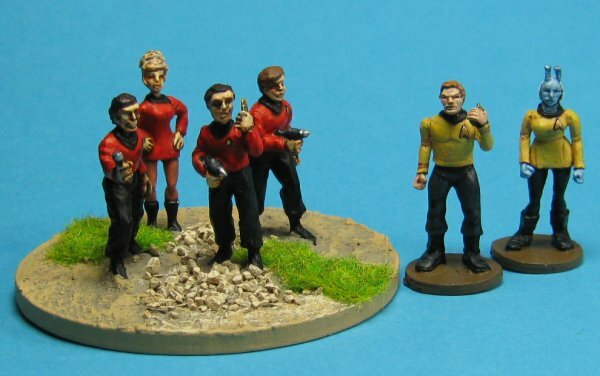 Here are a pair of security teams and the command stand of Kirk and Spock. 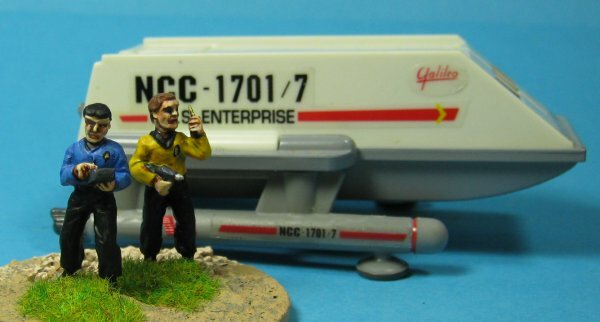 Finally the command stand and a Playmates shuttlecraft. 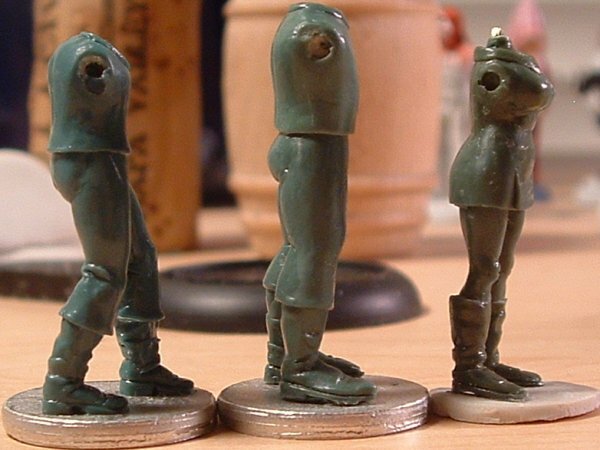 Here's how they look with the original castings. Three Hasslefree miniatures additions to my crew.